Welcome to my homepage. I assume that if you've found your way here you've probably already read one of my books - in which case, thank you. I hope you enjoyed it (or preferably them), and if you've any thoughts I'd love to hear them. Use the e-mail link at the bottom of the About the Author page. 17.10.17 BOOK THE TIGER'S PREY is out in hardback in the USA. 27.9.17 EVENT Join me at Waterstones York to celebrate publication of THE TIGER'S PREY, and get the inside story on what it's like to work with one of the world's greatest adventure writers. 7pm start. 14.9.17 EVENT I'll be at Explore York with New York Times bestselling author Ruth Ware, launching York's Big City Read with a discussion of Helen Cadbury's TO CATCH A RABBIT. 6-7pm. 7.9.17 BOOK THE TIGER'S PREY is out in hardback in the UK. 24.8.17 NEWS THE TIGER'S PREY is Number 1 in South Africa! 1.4.16 NEWS I can finally announce the exciting news: my next novel will be a collaboration, co-written with Wilbur Smith. 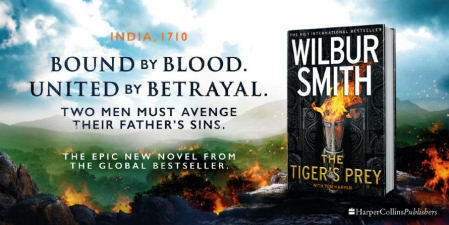 THE TIGER'S PREY continues the sage of the Courtney family as they battle for fortune and glory across three continents.